Crafted from a blend of more than 20 traditional English and French cider apple varieties from our orchard on Vashon Island, WA. These special apples contribute a richness of flavor and character to cider that can’t be achieved with ordinary culinary apples. Kingston Black apples are often considered the epitome of cider apples. They produce a cider rich in flavor, slightly bitter, and medium bodied. Kingston Black takes its name from the town of Kingston near Taunton in Somerset, England–the heart of cider in the UK. It is thought to have been originally identified in the 19th century. This is a limited bottling, with only 103 cases produced in 2018. Our Manchurian Cider is made from a blend of apples, but features the unique characteristics of the Manchurian Crabapple. This petite yet bold apple imparts flavor and dimension to cider on a scale much larger than its size predicts. Our Pippin Cider is a single varietal cider made from Newtown Pippin apples, one of the oldest American apple varieties. The Newtown Pippin apple has an exceptional balance of flavors to make a bright and crisp single varietal cider. Light and refreshing with notes of green apple and a clean finish, it almost drinks more like a sparkling white wine. 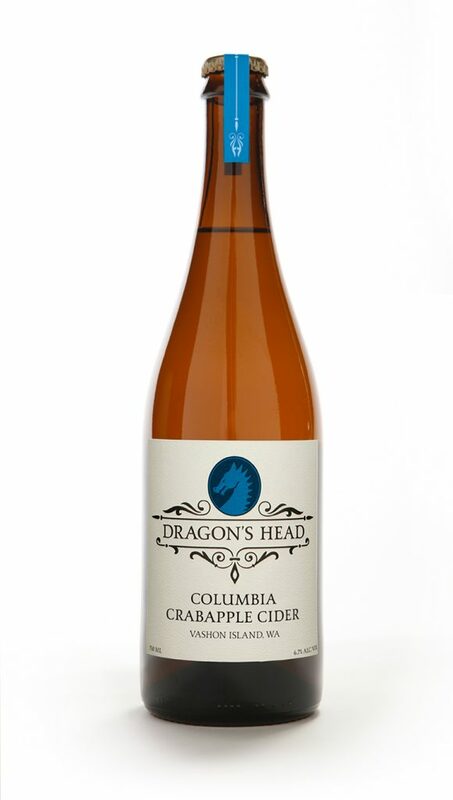 At Dragon’s Head Cider, we have a history of working with crabapples, coaxing these high acid, boldly flavored fruits into lovely fermented beverages. The Columbia Crabapple is our latest foray into the world of producing cider with crabapples, and it makes a bold statement. Dragon’s Head is known for producing dry ciders, and this cider is sweeter than any other we have produced before. The sweetness is countered by the tartness of the crabapple, producing a flavorful delight to the palate. While this cider drinks nicely on it’s own, we also find ourselves particularly inspired by it to create new and lovely cider cocktails. Made with 100% pears. Our Perry features seedling pears that are unique to Vashon Island, harvested from trees that were likely planted by homesteaders around 100 years ago. These Vashon pears are blended with true English perry pears. The Perry has a subtle sweetness, a delicate pear flavor, and lovely round tannins.